Located on a westward sloping full city block bounded by Fifth and Sixth Avenue and Madison and Spring Streets, this 12-story building is setback toward Sixth Avenue with a prominent terrazzo forecourt and entry stairway and surrounded to the west, north and south by lawn, shrubs and mature trees. It exhibits a distinctive three-part, stepped-back façade composition and is a notable local example of Moderne design in the WPA/Striped Classicism design mode. The Fifth Avenue façade is symmetrical and exhibits a Neo-Classical building form with a three-story base that forms a podium or pedestal, a seven-story shaft defined by fenestration that creates the illusion of a classical colonnade surmounted by a wide band of wall area punctuated by a row of single window openings that create a dentil course indicative of a classical entablature. The shaft is capped by a further stepped-back, two-story penthouse. Minimal terra cotta and metal ornament is concentrated at the base and executed in geometric accents, including square, circular, wave and scallop motifs. The reinforced concrete structure has a concrete foundation and basement level and is clad with terra cotta panels that vary in color, size and arrangement. The building measures 104’ x 220’ and steps back from the Fifth Avenue façade at the top of the 3rd and 10th floor levels. The base is clad at the first floor level with 1’ x 2’ red-granite color terra cotta panels and at the second and third floor levels with 1’ x 4’ light-gray granite color panels. All of the terra cotta panels at the base are laid in an English bond with alternating courses of headers and stretchers, which gives it the appearance of a stone foundation. The red-granite terra cotta is also used at the entry stair cheeks at both the Fifth and Sixth Avenue entryways The red-granite portion of the base is accentuated by three central recessed entry vestibules each with sets of aluminum doors that are trimmed with fluted cast bronze. Centered above the vestibules are cast bronze letters that identify “UNITED STATES COURTHOUSE.” The vestibules are flanked by large nearly square window openings with nine-light pattern steel frame windows that are typical throughout building. The second and third floor levels are clad with light-gray terra cotta panels and punctuated by ten recessed two-story window bays with steel frame windows and cast iron spandrels. The window frames and spandrels are painted a salmon color and contrast with the adjacent terra cotta, creating vertical strips along the façade. Spandrel panels at the 2nd floor level are decorated with raised square geometric patterns and the upper panels include a modified Art Deco-inspired Greek key fret and vertical fluting. Windows trim matches the terra cotta cladding and is decorated with raised square geometric patterns. A denticulated moulding serves as a cornice and distinguishes the top of the base. The face of the seven-story building shaft is set back 15 ft from the face of the base. All of the upper floor shaft is clad with light-gray granite color terra cotta panels measuring 1’ x 4’ and laid in stretcher course. The façade is distinguished by nine tall recessed window bays that extend six stories in height. The standard steel window units are separated by simple cast iron spandrels that reflect the window glazing pattern. The unornamented window surrounds match the adjacent wall surface. Surmounting this colonnade-like element at 10th floor level are fifteen square windows that extend the width of façade. The shaft is capped by a deep unadorned expanse of light-gray granite color terra cotta cladding. Stepped back from the face of the shaft is a similarly-clad two-story penthouse with nine similarly detailed 2-story windows. The east elevation exhibits nearly identical fenestration and façade composition with the exception of the red-granite base portion that due to the grade change terminates at the side elevations. Both the north and south side elevations are nearly identical in vertical composition and architectural detail. The interior is currently closed to the public due to construction activity. The interior is reported to be distinguished by two formal entrance lobbies, elevator lobbies and courtroom spaces. The Fifth and Sixth Avenue entrance vestibule and lobby walls are reported to be clad with polychromatic terra cotta panels in pink, turquoise, and beige. They exhibit terrazzo floors in dark red, light red and beige colors that are set in squares that correspond to coffered ceiling panels above and dentil mouldings at ceiling and wall coves. The lobby interiors are also reported to include custom designed pyramid-shaped incandescent light fixtures and Art Deco-inspired ornamented aluminum radiator covers. The main elevator lobbies are distinguished by coffered ceilings with cove lighting, terrazzo floors with star emblems and baked black enamel elevator doors with vertical fluted aluminum ornament. Elevator lobbies at the upper floors include similar finishes but with more simplified designs. Five major courtrooms are reported to be distinguished by coved ceilings, fluted Doric columns, ornate pilasters and judge’s benches using polished American black walnut, aluminum window grill covers with star emblems at the cross members and custom designed aluminum wall clocks. Kvapil, John. 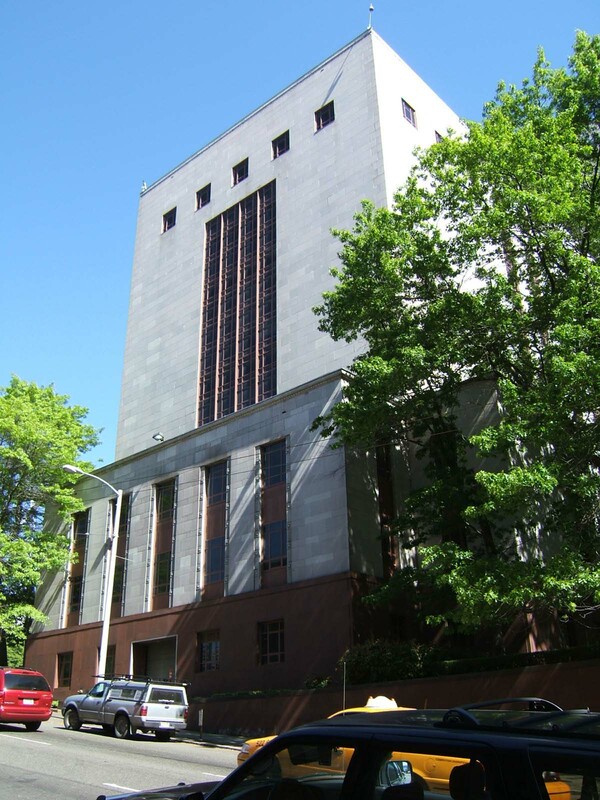 "United States Court House, Seattle, Washington" National Register of Historic Places Nomination Form, n.d.